Three researchers from the Department of Electrical & Computer Engineering were recently presented with a Best Symposium Paper Award at the Institute of Electrical and Electronics Engineers’ (IEEE) Resilience Week in Wilmington, Delaware. Arif Sarwat, associate professor and director of both the FPL-FIU Solar Facility and Energy, Power & Sustainability group (EPS); Longfei Wei, doctoral student and researcher from the EPS Lab; and Aditya Sundararajan, doctoral student and researcher from the EPS Lab were the authors of the winning paper, titled A Distributed Intelligent Framework for Electricity Theft Detection Using Benford’s Law and Stackelberg Game. Sarwat and his team’s research proposes a distributed intelligent framework for electricity theft detection. Using big data analytic and game theoretic methods, Sarwat and the researchers from the EPS group address the increasing concerns of smart meter energy consumption tampering and fraud. The work was validated using real-world datasets to enhance its applicability. 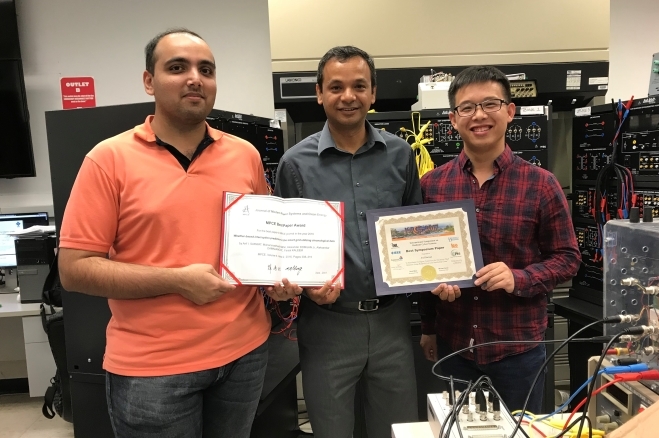 Co-authors of the winning paper include Saroj Biswas, professor of Temple University’s Department of Electrical and Computer Engineering, and Erfan Ibrahim, center director at the National Renewable Energy Laboratory (NREL). Another Best Paper award was announced for the EPS group this past July at the 2017 Advisory Board & Editorial Board Meeting of Journal of Modern Power Systems and Clean Energy (MPCE) held in Chicago, Illinois. Arif Sarwat, Mohammadhadi Amini, Alexander Domijan Jr., Aleksander Damjanovic and Faisal Kaleem were presented with the MPCE Best Paper Award for the best paper in the MPCE journal in 2016 for their work titled, Weather-based Interruption Prediction in the Smart Grid Utilizing Chronological Data. The research presented in the paper shows the development of a tool that can predict in short and long term the number of failures and power interruptions that could happen on an electric smart grid system in a region. The Journal of Modern Power Systems and Clean Energy is committed to presenting academic achievements in the fields of modern power systems and clean energy by international engineers and researchers.